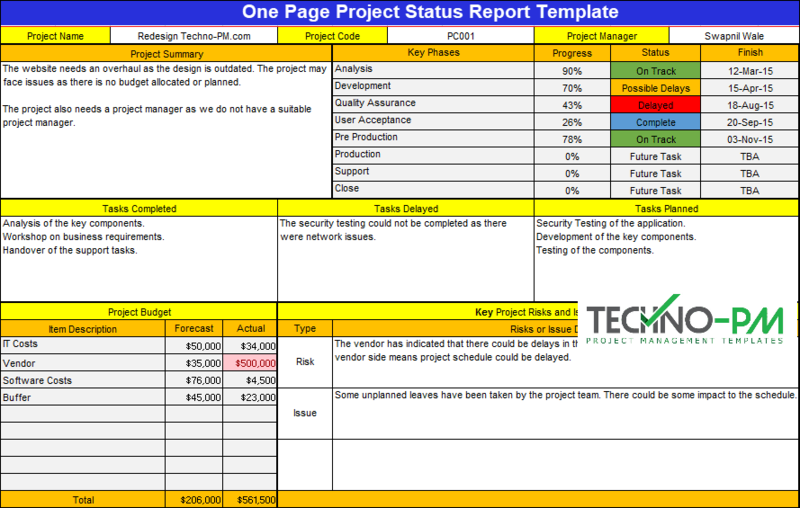 Having an effective project status report is one of the key tasks for any project manager. In today's work culture where people do multitasking and work on different projects, it is essential that the information presented be precise and simple to read. The excel template is designed to fit into a single page to make it readable and easy to print. The status report is divided into 5 sections which cover the critical aspects of a project - Project Summary, Key Phases or Schedule, Tasks information, Project Budget, and Project Risks and issues. 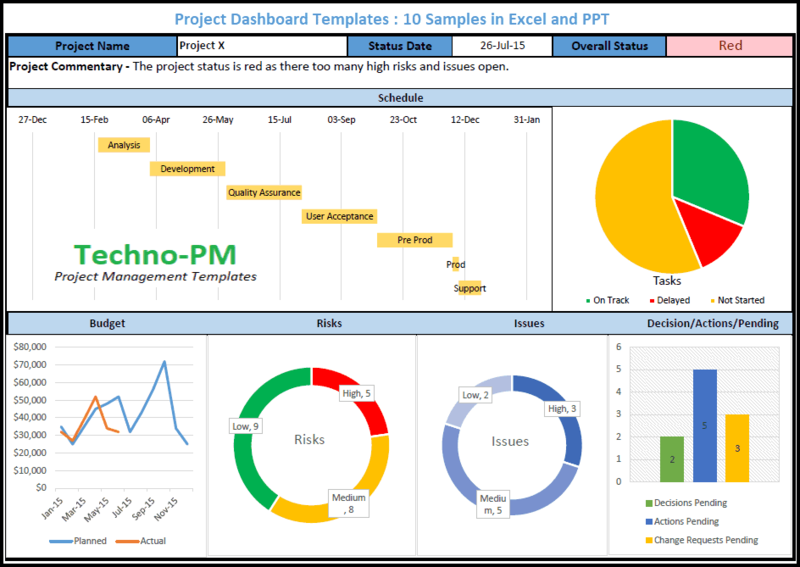 Before the summary section, there are some basic parameters for each report which are - Project Name, Project Code and Project Manager which are self-explanatory. The Project Summary Section has an update for the latest project news. It can also talk about the key issues or risks currently affecting the project, or it can even talk about any key milestone achieved. The summary has to be short and informative so that people can get an overview of the entire project. Phase Name - The Name of the current phase. In a typical IT Project, there will be an Analysis, Development, Quality Assurance sections. Try to keep the number of phases low and mention only high-level phases. Progress - Is the measure of the phase in % complete. Status - On-Track or Green, Possible Delays or Amber, Delayed or Red, Complete or Blue and no color for a future task. Finish - The planned date for the phase to finish. Note: The excel template contains the drop downs for Status Field. 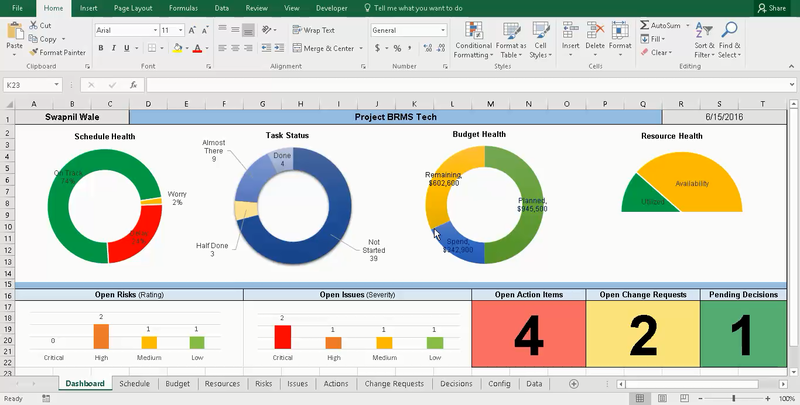 The tasks section will give the report reader an idea about the current status of project tasks. The tasks section contains 3 sub-sections - Tasks Completed, Tasks Delayed and Tasks Planned. Each section will contain a short and brief description of tasks. Care needs to be taken to make sure that the task details are readable. Please see examples below - the key is to keep it short and simple. 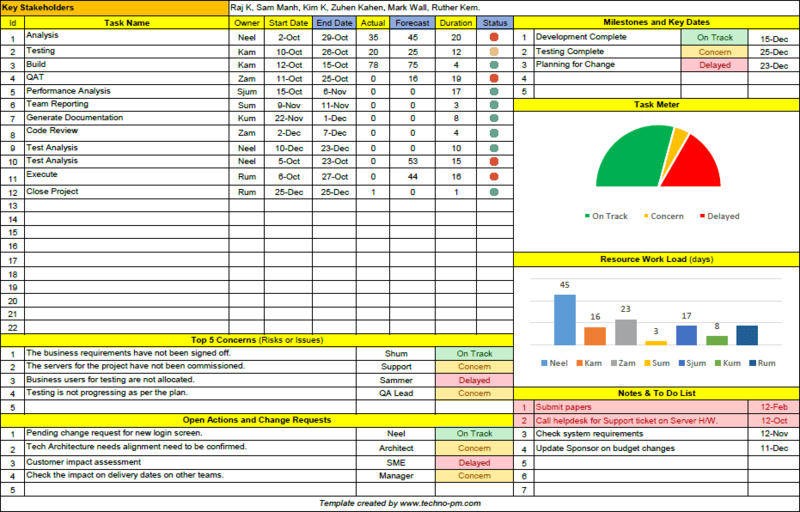 Tasks Completed - List of Tasks completed in the current reporting period. Tasks Delayed - Tasks which were to be completed this reporting period but were not completed. Tasks Planned - The tasks planned for next week or reporting period. The budget section of the report details the financials of the project. There 3 key columns - Item description, Forecast, and Actual. The template totals the values at the bottom. The template contains logic to highlight a value if the actual is greater than forecast. 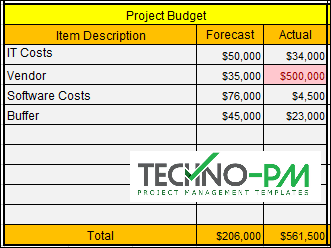 Item Description - A brief description of the item against which a cost is budgeted. Forecast - What was the forecast amount for that item. Actual - What is the actual spending so far on the item. The risks and issues section is meant to capture the key risks and issues affecting the project. There are two columns - Type and Risks or Issue Description. Type indicates whether the item is an issue or risk. The description is a brief description of the issue or risk, The description can also contain a comment to indicate what is being done about the risk or issue. You can also note down the possible mitigation for the risks or issue in the description column.